You don’t have to be flexible to start incorporating Pilates exercises into your fitness routine. When your muscles restrict your body from doing a particular move or an exercise because of a lack of flexibility, the ability to work your core deeply is compromised. When your body is weak from a back injury or a weak midsection, it naturally compensates by overuse of the muscles. The balance of the body is then compromised, resulting in more injuries. Taking time off to heal an injury is frustrating, and it sets your fitness goals back and can be discouraging. But by adding in a daily regimen of Pilates, you can increase your flexibility and, more importantly, tighten your core at the same time! Pilates bodyweight exercise uses the body’s own resistance and mechanics to strengthen the core from the inside out. Challenge your fitness level — doing a traditional sit up is a breeze when you take the next step and incorporate the Pilates bodyweight program. Expect to sweat in less than 3 minutes with the core moves. The only workout that targets the deep transverse abdominals, also known as the foundation of the body, to strengthen it as a whole. Work the intricate muscles that protect the low back, spine, pelvis and hips. Reduce the risk of injury with these bodyweight moves that encourage the body to work as a whole rather than targeting individual muscle movements. Increased endurance comes as a bonus — with a strong core the body performs at its optimal level. Make your body stiff and immobile. So how should you incorporate this great form of core training into your workouts? You can add the core Pilates exercises to an already existing fitness routine, or practice them on an off day for recovery. I asked my friend Justin, an L2 Crossfit Coach and former Pro Baseball player, to help me demonstrate this core move. With continued practice you will see a noticeable difference in your flexibility and core strength. Keep your belly button pulled in towards your spine at all times. Do not thrust your ribs forward. Control your breath so you are pulling your ribs in towards each and breathing to the side and back of the body. Extend one leg straight up to the sky and the other parallel to the floor. If holding the legs straight is a challenge, slightly bend both knees. Keep your pelvis and hips as still as possible during the movement. Continue to breathe through the exercise with control. Don’t throw your legs and body around. Control each movement. Do not tuck your chin down to your chest — keep your head in line with your spine the entire time. Give it a try — the benefits and results will surprise you! Have fun and enjoy a stronger core with Pilates! I have taught Pilates for 10 years and functional training/calisthenics for a few as well. I have noticed quite a few fitness professionals demonstrating exercises and passing them off as Pilates when in fact they have little to no connection with the actual method. The photo of the forearm plank with hip and knee flexion (or should i say mountain climber on forearms?) is not a pilates exercise. I might be overly pedantic but I think if your going to claim to teach Pilates, own it and show Pilates only moves. I always added my own variations which were more in the calisthenics arena but never claimed it was Pilates. A fellow Pilates instructor its a pleasure to meet you =) I couldn’t agree with you more in regard to many fitness pros claiming to know Pilates. I ve taught and owned my Pilates studio for over 13 years and have seen a variety of Pilates being taught. 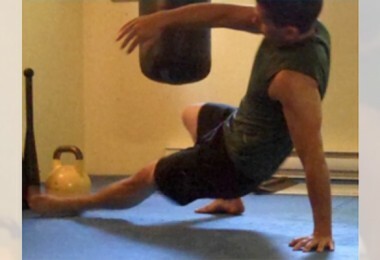 The picture you mentioned does appear to a mountain climber with a plank, it’s a partial move. But it’s actually a down stretch combined with an up stretched commonly performed on a reformer. I modified the move to be performed on the mat as reformers are not readily available for at home programs. The movement is required to be done on the hands versus forearms, however for beginners the pressure on the hands/wrists is a challenge which is why I modified it to be done on the forearms. Great to see pilates on here. I’ve found some of the core principles helpful when weight training. Would like to know more. Please can we see some more posts ? I’m excited to share more core Pilates tips and movements! Great to see Pilates getting credit here. I can’t say enough in support of it, since it has been so key in me regaining mobility and freedom from back pain following a car accident 25 years ago. I suffered like hell for a good 12 years, using braces, painkillers, whatever it took to ease the pain and as for the sudden spasms of pain if I made one wrong move…. I finally “discovered” Pilates and after 6 weeks, I was walking better and started to throw away the aids to help me walk. You DO have to keep it up but the important point is that it gives real core strength to your body and therefore you walk taller and your whole gait is improved. I rarely take painkillers now (except if I have a really rotten headache) and as for back spasms – what are those? I haven’t had one in nearly 10 years! Don’t underestimate the value of Pilates – when it is done properly and consistently, it is an enormous aid to any fitness regime. Hell, if it is goo enough for top Olympic athletes, then it is good enough for me! Wow! that is an amazing story, thank you for sharing. I’m glad you are healthy and here to share your story. It’s great to hear how Pilates has helped to strengthen your body and not having to rely on the pain killers. I can relate to being in a car accident, I ruined my shoulder and back, Pilates was key to alleviate the pain and regain mobility and strength. While I have never taken Pilates, I would think it to be wrong of Adam (or anyone, for that matter) to discredit something, just because they feel it has no place in a fitness routine by viewing it as inferior. I gather fitness information from all kinds of sources, web sites aimed at both male and femalle readers, to formulate my own approach. Something can be learned from anyone. hi have working out for 5 years. until january 1th 2013, i didn’t tried pilates. added it to my workout routine for 18 days. it’s amazing. while doing my weight liftthing and tabata cardio with bodyweight exercise, more focus and breathe deeply. it help my posture, also help burn more calori. according to my heart rate monitor, burned 80-90 calori more while doing cardio. like it very much. Great job Kayra! Keep adding it to your routine and you will be amazed with how much your endurance and stamina will increase. I’m excited for you! How do you feel about the pilates reformers that QVC sells for home use? A lot of people call in and say it’s easy but they get a lot of benefits from using it. I believe the reformers qvc sells are Aero Pilates reformers. I’ve used these reformers, I like them for home programs. Mainly because they are simple and user friendly. Some of the other reformers are bigger, have more accessories and features that can be a bit confusing. The only time I would suggest investing in a bigger reformer normally seen in a professional studio is if you’ve taken Pilates sessions from a certified instructor in the past and are comfortable with some of the more advanced moves. I’d stick with a simple reformer. You will get a great workout with the Aero Pilates reformer, it usually comes with a cardio rebounder it’s a great lower body workout which I really like without putting strain on the joints. I am a retired massage therapist trained by osteopaths from England and I have found that pilates if taught by a knowledgeable instructor is very powerful in helping with postural issues that can cause severe pain down the road from subluxated joints in the neck, shoulders and lower back. I’m a registered nurse who recently herniated 3 discs in my low back lifting patients. I’ve tried physical therapy, chiroparactors, epidurals, etc., but have yet to have any relief of pain. I was encouraged reading Irene’s story above and would like to try pilates. Is there a pilates program currently on the market that you would recommend that I could do from home? My first thought is that, no matter how much you want to do this at home, you really could do with seeing an instructor who will give you the absolute basics of Pilates and, even more importantly, they will correct any problems that they see and help you to do the exercises in the right way. This is where I started and it was the best investment I ever made. Yes, it darned well hurt for the first week or two but, as my core muscles supporting the spine got stronger, I was able to do more. Once I had got those first 6 weeks under my belt, I would go to a group class for a 4 week block (once a week for 4 weeks) and then used a video at home in between, especially if I needed it. Also, DO read Lynne Robinson’s own story/profile. She was in a dire state when she found Pilates and has been one of the UK’s leading proponents and trainer of teachers. Hi Kelly! Ouch! I know that is painful. I would recommend the body weight Pilates at home program, Adam mentioned it above at the end of this post, there is the link to the page which describes the program. When you start your Pilates program stick with it and in the beginning cut the amount of reps in half. Then gradually add more reps as you start to feel yourself getting stronger and familiar with the moves. Let me know if you have any questions, I’m happy to help! I just went onto your website and saw a pic of what looks like crunches. Are crunches and situps part of your pilates workout as I believe it is bad for the back etc? Hi Janine….No, I don’t use crunches or sit ups. Although the pictures you saw looks like it they are called “chest lift” or “ab lift”. When doing a situp or crunch there’s quite a bit of pulling on the back of the neck, tucking the chin to chest and thrusting of the pelvis. This causes pain in the back, neck and shoulders. A bad habit I help my clients to break. Pilates movements like the ones you saw on my website focuses on the proper alignment of the head and spine. This helps to strengthen the core without pressure in the back/neck or shoulders. So there is no tucking of the chin, pulling on the back of the neck and tightening the hips flexors, by avoiding this we stay out of the back and focus on deep core abdominal muscles.